What's Included In The Box? 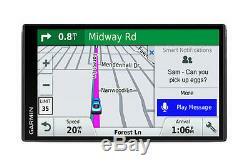 The Garmin DriveSmart 61 LMT-S ships with the following items included. Lifetime maps¹ and live traffic² (indicated by LMT-S after model number on the box). Advanced Navigation with Smart Features. Easy-to-use GPS navigator with connected features and bright 6.95-inch capacitive touch, edge-to-edge display. Detailed maps of North America with free lifetime¹ updates. Provides real-time services such as live traffic² and live parking³. Bluetooth® hands-free calling³ and voice-activated navigation. Built-in Wi-Fi® for easy map and software updates. Stay connected behind the wheel with Garmin DriveSmart, the navigator that features a collection of smart features in addition to helpful driver alerts and easy-to-follow directions. From hands-free calling and live traffic information to built-in Wi-Fi and more the future is on your Garmin. Just look ahead and drive. Clear and Bright from Edge to Edge. Garmin DriveSmart 61 features our easiest-to-see display yet. View your directions at a glance on a bright, clear screen. Includes a 6.95-inch glass display that goes from edge to edge on the device. The capacitive touch surface lets you pinch to zoom if you need a closer view. Live Services for Your Drive. Outsmart traffic jams with time-saving alternate routes or by avoiding them altogether. Then, with live information, spend less time circling the block to look for parking. For traffic alerts, relevant rerouting directions and up-to-date weather forecasts, download the Smartphone Link app, which connects your Garmin DriveSmart with your compatible smartphone. As you near your destination, take the stress out of parking by viewing pricing and availability trends for on-street public parking. The Smartphone Link app also enables LiveTrack², which lets drivers share their location so friends can track your whereabouts whether you are running errands around town or taking a long road trip. Putting the Smart in Smart Connectivity. When you sync your Bluetooth-enabled smartphone to Garmin DriveSmart, you get great features that let you stay connected without taking your hands off the wheel. Garmin DriveSmart features voice-activated navigation that responds to your commands and then navigates to where you need to go. Wi-Fi Keeps You up to Date. We make it easy to keep your maps and software up to date now that the Garmin DriveSmart navigator features built-in Wi-Fi. When a new update is available and youre on your wireless home network, youll automatically receive an onscreen notification. Thats your cue to plug your device into any outlet and let it update over Wi-Fi while it charges. Then youll be ready to hit the road again. Driver Alerts: Know Your Surroundings. To encourage safer driving and increase situational awareness, Garmin DriveSmart provides driver alerts for sharp curves, speed changes, railroad crossings and animal crossings. Additionally, the navigator will warn you when driving the wrong way on a one-way street and alert you to nearby schools and school zones. Receive notifications for nearby red light cameras and speed cameras6, and even get fatigue warnings that suggest potential rest areas after several hours of driving. More Navigation from Your Garmin Smartwatch. Also get helpful driver alerts on your watch. Dont worry about losing your car in a crowded parking lot; your smartwatch provides compass guidance from your parked vehicle to your destination and back to your vehicle again. Road Trips Just Got Better with TripAdvisor®. When youre not familiar with the area, its nice to have something to point you in the right direction. Thats why were bringing TripAdvisor to your Garmin DriveSmart navigator. View ratings for travel points of interest, such as hotels, restaurants and attractions, along your route or near your destination. From the worlds largest travel site directly to your car, were helping you find the stops that make the entire journey part of the destination. Also locate new attractions with the built-in Trip Planner tool, which adds fun to road trips by suggesting interesting stops along the way. Friendly Guidance from Garmin Real Directions. Redefine spoken turn-by-turn directions with Garmin Real Directions. Our easy-to-understand driving directions use recognizable landmarks, buildings and traffic lights in addition to spoken street names, guiding you as if your best friend is sitting in the passenger seat. No more squinting to read distant street signs. Just listen for Garmin Real Directions to tell you, Turn left after the QT, or Turn right after the red building. Following directions has never been easier. Works with Garmin Backup Camera. Once connected, you can easily see vehicles, pedestrians and other obstacles right on the Garmin DriveSmart display as you move in reverse. The quality of map data can make all the difference between finding your destination and getting lost. High-quality HERE map data enables your Garmin device to provide you with the information you need, when you need it most reducing the frustrations of driving by avoiding delays and cutting down the time you spend in your car. Physical & Performance Physical dimensions 6.8W x 3.9H x 0.7D (17.3 x 9.9 x 1.9 cm) Display size, WxH 6.0"W x 3.5"H (15.2 x 8.9 cm); 6.95 diag (17.7 cm) Display resolution, WxH 1024 x 600 pixels Display type multi-touch, glass, WSVGA color TFT with white backlight Weight 8.57 oz (243 g) Battery rechargeable lithium-ion Battery life up to 1 hour High-sensitivity receiver Maps & Memory Preloaded street maps Includes lifetime map updates nüMaps Guarantee Built-in memory internal solid state Accepts data cards microSD card (not included) Custom POIs (ability to add additional points of interest) Waypoints/favorites/locations 1000 Navigation Features Speaks street names e. Turn right ON ELM STREET in 500 ft. Voice-activated navigation (operate device with spoken commands) Traffic compatible (routes around traffic with a receiver and subscription) Lifetime traffic updates (receive free lifetime traffic updates) Lane assist (guides to proper lane for navigation) Junction view (displays junction signs) Route avoidance avoid highways, tolls etc. Hands-free calling Speed limit indicator displays speed limit for most major roads in the U. And Europe View upcoming points of interest along route Additional Trip planner Trip log Garmin Real Directions landmark guidance Foursquare POIs BLE capable. 6.8 in W x 3.9 in H x 0.7 in D (17.3 x 9.9 x 1.9 cm). 6.0 in W x 3.5 in H (15.2 x 8.9 cm); 6.95 in diag (17.7 cm). Multi-touch, glass, WSVGA color TFT with white backlight. 8.57 oz (243 g). Garmin Connect compatible (online community where you analyze, categorize and share data). Turn right in 500 ft. Speech recognition (navigate with voice commands). Route avoidance avoid highways, tolls etc. Custom POIs (ability to add additional points of interest). Hands-free calling with Bluetooth® wireless technology. Data Services with Bluetooth Technology. The item "Garmin DriveSmart 61 LMT-S Automotive Automotive GPS with Lifetime Maps of NA" is in sale since Tuesday, January 30, 2018.